I’m not gonna lie, these guys take a little bit of fortitude the first time you make them. But truthfully, once you get a batch under your belt, you are a pro. Maybe it’s the fact that I’m not a baker that anytime I see yeast invited to the party, I get a little apprehensive with my cooking chops. Or that this particular recipe has you coaxing coconut water, coconut milk and raw rice into a batter to make lacy crepes. Or above all that, that you’re looking at a good 12 hours of waiting for it to do its thing before you even get to cook. Well, I’m here to tell you not to fret, my pets, as you’ve totally got this. 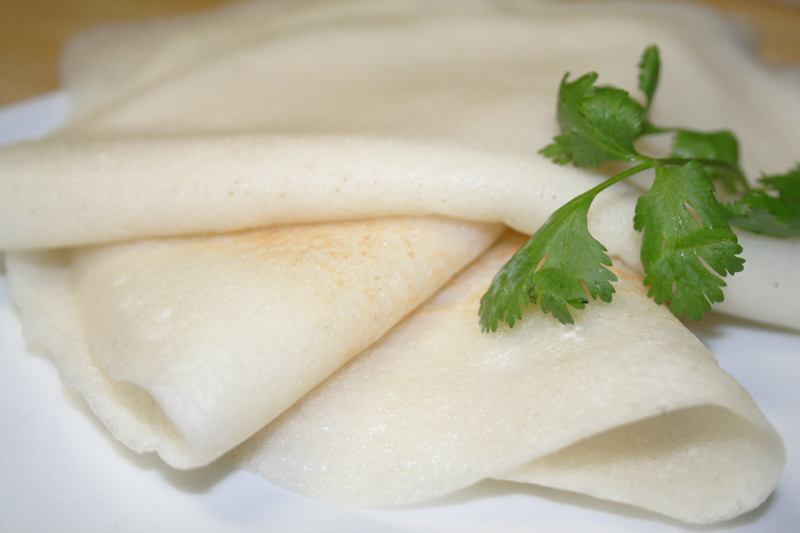 These pancakes are very similar to the Southern Indian dosa (lentil pancakes) that are served here in this country, with the added boon that they are flavored with lush coconut. They are perfect for sopping up curry or, better yet, filled with potatoes and peas and folded like a quesadilla. Better yet, they are vegan and gluten free, making them perfect for parties where you have eaters with dietary restrictions. A party is much sexier when all can partake! There is a rule in The Daring Kitchen that the host can require an element of the challenge to be mandatory, and for this one, we all had to follow the same appam recipe. I found that Mary’s recipe was perfect to the letter – I trusted in it and it did me good. The only small elaboration that I’ve made in the version below is where she calls for cooked rice, I had none in the fridge to use and was not going to make a whole pot for 2 tbs. of rice. Fortuitously, I had a box of instant rice in the cabinet which worked perfectly – I microwaved 2 tbs of water until hot and added the dried rice and let sit for 5 minutes. It puffed up perfectly and I was in business. Alright, kids – adventure time! Put the rice in a large bowl and soak covered in water for at least 4 hours, or overnight. About 12 hours before you are ready to cook the pancakes, begin prepping your batter. Mix the sugar, coconut water and yeast in a small bowl and let it become frothy in a warm place. I just turned my oven on and put the bowl on the top of the oven surface. Let it hang out for 15 minutes. Drain the rice and add to a blender. Add the yeast mixture and cooked rice and blend until a smooth batter, adding splashes of coconut milk to help the mixture blend evenly. It should be thick like paste but still pourable like cake batter. Pour into a bowl, cover with plastic and leave in a warm place for 12 hours. Heat a medium, non-stick skillet over medium heat. While it warms, stir the coconut milk and salt into the batter. Thin with coconut water until the batter is the consistency of milk. You’ll need it to be thin enough to swirl around the skillet like you’re making a crepe. When the skillet is warm, put a bit of oil on a paper towel and wipe the pan to grease it lightly. Pour a 1/4 cup of batter in the pan and swirl it around to cover. Put a lid on the pan and allow the crepe to steam and form lacy bubbles on the surface of the pancake, cooking for 1-2 minutes. Remove the lid and check the pancake to make sure it’s set in the center and slightly golden on the bottom. Use an offset spatula to fold the pancake into a half moon and then remove to a plate. Continue cooking the pancakes in the same way until you run out of batter. Serve with a tasty curry or savory chutney of your choosing. Thanks, Andy! It looks like you had great success with yours as well 🙂 I had to thin my batter quite a bit with coconut water to get them lacy and lovely, but before that, I felt like I had coconut rice frisbees on my hands! Needless to say, those failed appams didn't make the photo shoot. What a feast you prepared! I did much the same in preparing for the challenge, and we really enjoyed ourselves and the food too! Everything looks fantastic, and thank you so much for participating!